Anemometer / Lux / Light Meter. 100,000 + 3 Range. 200, 000 + 4 Range. 50,000 + 3 Range. Car DVR Black Box / Data Saver. Distance Meter / Range Finders. EC / TDS / PPM Conductometers. 3-in-1 EC/ CF /TDS Waterproof. EC - PenType Meter 01999us/cm. EC - PenType Waterproof ms/cm. EC -PenType Meter 019.99ms/cm. EC/ PPM /CF - Nutra-Wand Stick. TDS - Monitor + Power Adaptor. TDS - PenType Meter 0-1999ppm. Face & Skin Moisture Analyzer. Set A (3 items /set). Set C (3 items /set). Set D (4 items /set). Set E (9 items /set). Set F (7 items /set). Set N (9 items /set). Set P (8 items /set). Gem Tools / Testing Kits. 3-in-1 (ORP/ PH / Temperature). ORP Meter + Power Adaptor. PH & PH/ORP(2 in 1) Controller. Water Quality Tester & Meter. 3-in-1 ORP(MV) + PH + Temp. Handheld pH Meter + Temp. Pen Type pH Meter + solutions. PH + Adaptor + Electrode (NEW). PH + FixedElectrode + solution. PH meter + Electrode +Solution. PH Electrode + 1 meter Cable. 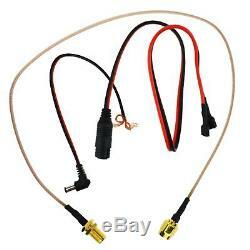 PH Electrode + 3 meter Cable. PH Meter + TDS (2-in-1). Soil pH Meter (long Electrode). Soil pH Meter(Short Electrode). Waterproof Pen Type pH Meter. AL 0-25/Brix 0-40 Grape Wine. Antifreeze / Battery / Fluid. Beer / Wort / 0-32% Brix. Brix 0-10% ATC (Low Sugar, CNC). Brix 0-18% ATC (Low Sugar, CNC). Brix 0-32% ATC (Sugar etc). Clinical / Serum / Protein. AL 0-25 / Brix 0-40 Grape Wine. 80 LED - 70 mm. 144 LED - 61mm 4 Zone Control. Sound & Temp / Moisture Meter. 4 PIN Wood Moisture Meter. Two K-Type w/ 2 Thermocouples. You will receive our newsletter once a week. 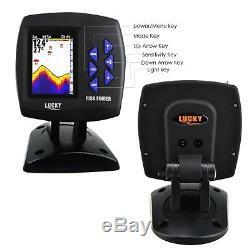 LUCKY Color Display Boat Fish Finder Wireless Remote Control 300m/ 980ft Fishing. 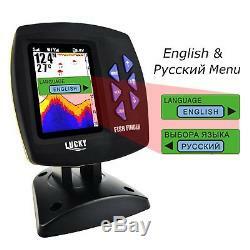 Professional and amateur fishermen love this fish finder to find out the location as well as the depth of fish and bottom contour of water. 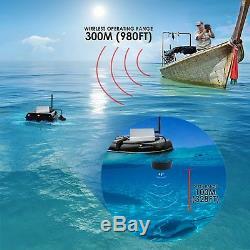 Ideal for Ocean, river or lake and detecting a Fish or school of fish in any particular area has never been this easy. 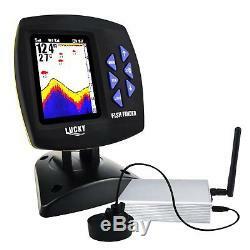 This fish finder literally brings the fish to you. 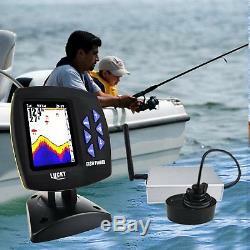 This fish finder is designed to be used with a bait boat. Just simply install the Long - Distance signal tower (transmitting antenna) to your bait boat, power on the signal tower, then you can power on your fish finder and enjoy fishing. Big COLORED 3.5 inches MVA/TFT LCD. Dual Language, English and Russian. Medium and small fish icons. Backlight Features with On/ Off White LED. 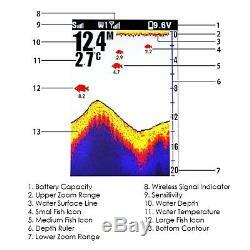 Measure water temperature and depth, and fish depth location. Set your own preferred setting in. Color tone (representing the bottom and structure on the display). Built-in memory automatically saves/stores current setting before turning the fish finder. Back lighting: On/off White LED. Unit Selections: Meters/ feet , Fahrenheit and Celsius. User mode Selections: Start Up, Simulation. Sonar beam angle: 45 degrees. Depth range: 3 328ft (1 100m). Operational frequency: 433.92 MHz. Maximum RF distance: 980ft (300m) (less than 980ft if the water is not smooth). Power Requirement :11 13V DC. Operational Temperature:-14 122°F (-10 50°C). 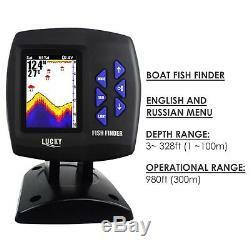 1 x Main unit Boat Fish Finder. 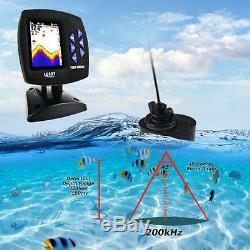 1 x Sonar Sensor with transmitter cable. 1 x Wireless Signal Tower. 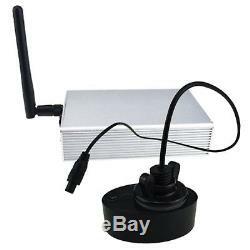 1 x Wireless Signal Tower Antenna. Meters/ feet, Fahrenheit and Celsius. We may ask you to return the item and offer you a brand-new one as replacement. We are also happy to offer personalized discounts for larger orders. 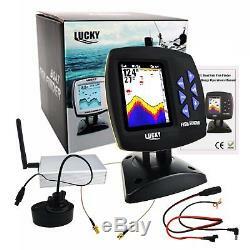 The item "LUCKY Color Display Boat Fish Finder Wireless Remote Control 300m/ 980ft Fishing" is in sale since Friday, January 19, 2018. 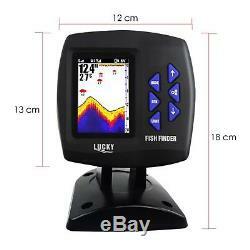 This item is in the category "Sporting Goods\Fishing\Fishfinders". The seller is "gainexpress" and is located in HK.